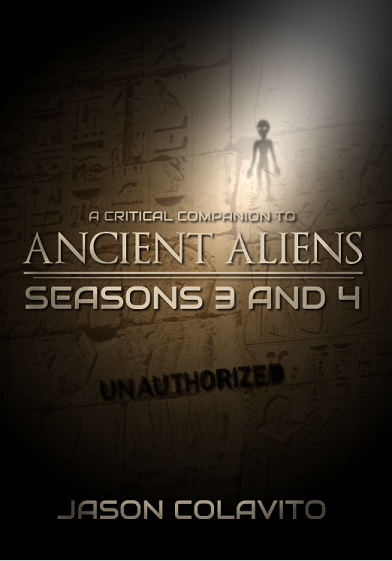 A Critical Companion to Ancient Aliens Seasons 3 and 4: Unauthorized is the only full length critical guide to Ancient Aliens from a skeptical perspective! Did extraterrestrial beings visit our planet in ancient times? That’s what the popular cable television program Ancient Aliens: The Series asks viewers to believe. But is it true? Only one book dares to weigh the evidence to find out once and for all if the “ancient astronaut theorists” appearing on Ancient Aliens really know what they’re talking about, or if their ideas are lighter than a UFO’s tractor beam. What you are about to read is a collection of skeptical xenoarchaeologist Jason Colavito’s episode-by-episode reviews and commentaries covering Seasons 3 and 4 of Ancient Aliens. This critical companion examines the specific claims made by ancient astronaut theorists on Ancient Aliens and evaluates them against the scientific, literary, and historical evidence. This book is not produced or endorsed by Ancient Aliens: The Series, Prometheus Entertainment, or A&E Television Networks. * Amazon.com ranking of top 10 best-selling archaeology new releases, December 2012.